Vinyl Cutting machines for both hobbyists and professionals built for small office or taking on the go can maximize your experience and ability to do what you love best. So, if you’re searching for the best vinyl cutting machine, and unsure where to look you’ve come to the right place. We’ve narrowed down the top picks and developed best vinyl cutting machine reviews based on cut and design software, compatibility, portability, warranty, ability to cut various materials, and which provide the best overall deals. We know the importance of USB, SDDC, and SD Card capability, and how helpful it can be to have a no-computer-needed, plug (USB) and play experience along with vinyl cutting machines that include an LCD (touch) screen, keypad, reasonable noise during functioning, and what type of blade holder or pinch roller adjustment features will be the most productive for your vinyl cutting machine needs. This is considered by us the best Vinyl Cutting Machine on the market! If you’re looking for a USB-Ready vinyl cutting machine, then the Brother ScanNCut CM100DM with Built-in Scanner is a leading and competing product ideal for you that utilizes the power of both touch-screen technology and more precise blades for cutting and not wasting materials. 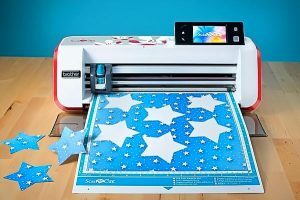 From cutting chipboard and bazzil, to pattern paper and stamps, handwritten designs and online design files can be translated into nearly any type of job with this vinyl cutting machine. The (touch) onscreen display is very responsive, easy to use, and allows for tremendous customization. It also includes a margin-cutting feature which takes the hassle out of guess-work and maximizes precision. Setting the cut depth and width are made easy with this machine and it has a strong reputation for efficiency among both beginners and experienced craftsmen. The Brother ScanNCut CM100DM’s ability to cut components that are an inch or less is also a tremendous improvement and sets the bar very high for competing machines. 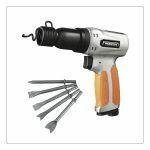 This machine is smart and remembers each cut and re-cut so if you must do so, the hassle of guesswork is again removed making for a more pleasurable, time-saving, and conveniently consistent experience. If you’re looking to accurately and practically cut larger vinyl, such as a vehicle or other business oriented signage then this is an excellent buy for the money. This isn’t to say that the Vinyl Cutter USCutter MH 34” vinyl cutting machine can’t be used for hobbyists, however, those with a 15” vinyl cutting machine that are looking to get more out of their cutting experience would benefit from this one substantially. Those that have experience using industrial equipment or have at least basic experience as an entry level cutter are ideal, although with the right amount of research and perhaps after watching a video tutorial online or two it won’t be hard for you yourself to become familiar with and maximize vinyl cutting experience using the USCutter MH 34in Vinyl Cutting Machine. It is a relatively easy to use out-of-the-box vinyl cutting machine and putting it together is made simple. It also includes Rhino 3D software if you need to create vector images and other specific design types – although this too can be learned without much hassle for most experienced hobbyist and professional vinyl cutters. It also includes lots of helpful materials such as vinyl sheets, magnet blanks, and even 2×30 ft. transfer tape (6″ each rolls), and even a hobby knife and squeegee -so you’ll be all set to get started once assembled. 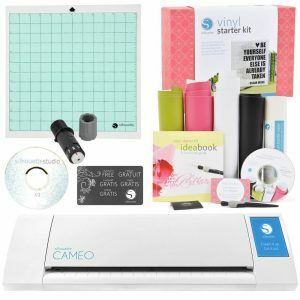 If you’re looking for the best vinyl cutting machine on a budget the Silhouette Cameo Electronic Cutting Machine Vinyl Starter Kit Bundle includes exactly what you need to get started. It even includes a $25 credit to purchase various (affordable) designs from their online market directly for your next project. The Silhouette Cameo is easy to use, and the program included allows you to simply select the type of material you’re going to cut, and then it adjusts the blades accordingly to both take the guess-work out of the equation and save you money. 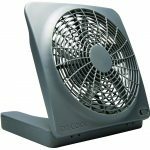 It also automatically adjusts the speed, and although a bit on the louder side when operating is an overall very efficient, durable, vinyl cutting machine. It is built to be able to take with you on the go, includes a premium quality touchscreen that is very responsive and durable, and leaves very little residue behind – also saving you unwanted losses of both your money and time by having to replace fabric support sheets. It even has a crosscutting tool that ensures an even edge with every cut. The software is easy to use, and customers have reported ease of consistent, practical use over time and are happy with the Silhouette Cameo in all-around build and performance. Hobbyists and professionals alike frequently use and benefit greatly from using a vinyl cutting machine to save both time and maximize production. Because there are so many various uses for these machines and the different types or models available on the market deciding as to which one might be best for you can be tough. If you’re an artist, frequently find yourself putting things down on paper or have an imagination for bringing your ideas to life, then a vinyl cutting machine is a great way to do it. These machines are practical and efficient for creating multi-use (adhesive in some cases or with extra tools) vinyl lettering for both at home or in the office. In fact, plenty of business owners and independent contractors rely on the creation and use of vinyl lettering, logos, and other graphics for advertising their business on their vehicles or even home and office windows. These precision fabric cutters can cut nearly just about any fabric plastic or paper type you can imagine. Many of them can also cut chipboard or bazzill, and both grade school and college students can use vinyl cutting machines for various project types – including “pop-up” 3D paper models and other cardboard projects. Many vinyl cutting machines can also be used with, and to create silkscreen labels, designs, or “covers” for their electronic and other devices to add both style and protection. If you happen to be familiar or experienced with a CNC machine you will learn that not only do vinyl cutting machines operate on a similar Y, X, Z, axis, but that you can also create “mini-models” of CNC projects and test them out before later operating a full-fledged (and pricey) CNC cut. As mentioned above, this is optimal for not only 3D models and pop-up objects, but also charts, scale models, and other business presentation materials. People also count on vinyl cutting machines to evolve their custom drawings into solid, craft projects. Many will use this machines for silkscreen labels, cards, and even origami. Finally, many apparel enthusiasts and businessmen use these machines to create labels, logos, trademarks, and more. A Buyers Guide: What makes a great Vinyl Cutting Machine? If you’re in the market for the best vinyl cutting machine there are several must-knows, factors, and dynamics to take into consideration before investing your money. Let’s explore some of the most important ones. Mobility– From 11.7” to 34” what you require out of your vinyl cutting machine should determine what size and type – or model – you go with. Would you prefer a stand-alone model that has a height of multiple feet that could be difficult to take with you on the go, or a lay-down model, of less than 15”x15” better suit you? Some models are stand-up, but no taller or wider than your average computer printer. Depending on what your intended uses are if you’re a hobbyist or professional, and how often you’re going to use your vinyl cutting machine should determine what types or models you consider investing in. Flexibility – How many different types of materials do you plan or see yourself using with your vinyl cutting machine? 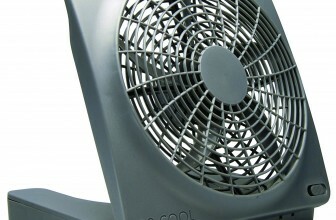 Depending on the demands of your hobby or job, one that has an especially deeper, stronger blade and includes fully adjustable pinch-rollers will likely suit you best if you’re going to be using anything from basic grade paper to construction paper, cardboard, vinyl paper, or other cloth materials. Modern Features– Would you consider yourself likely to benefit more from more advanced, or “modern” features from your vinyl cutting machine? If so, it’s important to give special consideration as to what types of features may be most practical, convenient, and efficient for you. 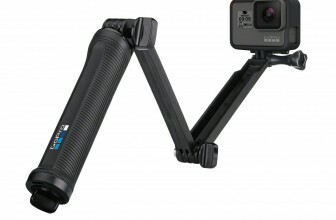 This can include LCD or touch screen compatibility, ability to function without a PC (i.e. USB only), what types of software it utilizes (or includes), and it’s ability to use “cloud” technology and other modern features you might require for work, or distributing your designs. Ease of Use– Before shopping around or making a choice on a new vinyl cutting machine consider what the various models and brands specialize in or are most well known for. Is the vinyl cutting machine you’re considering ready to use out-of-the-box? If not, what is the quality of instructions or guides included with the device? This leads us to our next and final point. Customer Service and Warranty – Never underestimate the purpose of quality and reputation of a vinyl cutting machine’s manufacturer to provide quality, consistent, and effective customer service. This, along with the details regarding warranty for your vinyl cutting machine can literally make the difference between being able to operate the device in a profitable manner, versus being stuck with a product you do not otherwise know or understand how to use – or worse, troubleshoot accordingly. Sometimes it can be as simple as missing an installation step, while other situations might call for part replacement, supplies recommendations, or even installation assistance due to a complex software or restrictive design variable environment – such as those which do not allow files, transfer, uploading, or the utilization of off-brand features, designs, or products. Whether you’re an avid crafter or a beginner of using digital and manual cutting machines, the Brother ScanNCut CM100DM is an excellent choice for those looking to combine performance and convenience. This vinyl cutting machine is made to be used quickly with cardstock, extract the data, and from there allows the user to customize the cut area and whether to add margins or not and exactly where. This cutting machine is effective for ‘fussy cutting’ elements from various types of paper, patterns, bazzil, and even chipboard. It’s simple to use with designs purchased or downloaded from online, and thanks to the touch screen maximize ease of use and the amount of work you can productive effectively and efficiently. Plenty of frequent hobbyists are tired of having to experience and find ways to deal with wobbly cuts, or guessing what and where to put the margins, and whether their vinyl cutting machine and system are going to do it the right way the first time. With the Brother ScanNCut CM100DM the process is extremely fast and is simple as scanning the print of the design or SnC, scanning your fabric in the device, positioning, and then setting the cutting machine to work its magic. There is also a very helpful cloud-based Brother Canvas website which assists in format conversions and maximizing the transfer of your wanted designs and details onto any type of desired fabrics. Customers are happy and enjoy that the Brother ScanNCut CM100DM is practically ready to go out-of-the-box, is ‘user-friendly’, and best of all thanks to it’s precise, well-designed premium grade build, frame, and blade, wasting paper and losing money will become a part of the past. Thanks to not requiring dies or cartridges, the cost is minimized, and a premium build maximizes both profitable and enjoyable vinyl cutting experience and finished work. Given the included lifetime customer support, we, along with experienced customers of Brother products are confident in naming the Brother ScanNCut CM100DM as the best Vinyl Cutting Machine on the market. Few customers have reported having trouble with loading and slipping paper when using or setting the rollers and pressing tools along with the ‘sticky-mat’. This, along with few reports of blade dulling should serve as a reminder of why it’s so important to carefully read the instructional manual, and if necessary just reach out to the Brother customer service directly for help – after all, the product includes free lifetime customer service. Some have also expressed frustration with the rules of this vinyl cutting machine, proprietary product, files, and other rights or regulations included. Also, few customers were unhappy with the pricing and being required to use the fabric support sheets and other necessary materials solely being restricted to Brother products. Ultimately, depending on what vinyl cutting machine you decide to go with it’s understandable that each product may strictly rely on certain file types, software’s, or certain brand materials. This is by no means inevitable with this or any other vinyl cutting machine, although if it was, in consideration of how many happy and return customers this product receives some might make the argument that these “restrictions” or difficulties are next to nothing in comparison to the challenges of durability, quality, or functionality of other competing vinyl cutting machines on the market. 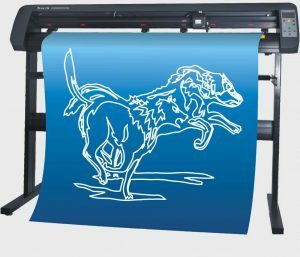 While a larger unit, the Vinyl Cutter USCutter MH is designed for just that, producing larger graphics, art, and even decals for either hobby or work purposes. This vinyl cutting machine was made out or reliable premium grade materials and includes a substantial amount of free vinyl to work with out of the box. The ‘cutter base’ is easy to assemble, and although a little on the “vague” side for some beginner users, there are plenty of videos and tutorials online, as well as directions and guides directly on their website that will likely answer most of your questions. The included Rhino 3D software for cutting vector images is designed for convenience and ease of use. It is efficient at importing images to the device directly, and is just one of many added “bonus products” included in this package deal. Also included is transfer tape to ease the process, a hobby knife, magnet materials, and even an interactive pen to use on the device for customizing what you import and the desired results. It is also MAC friendly which is a huge bonus, and the customer service is reported to be helpful by customers. Although USCutter is well known for and makes multiple, various sized and capacity vinyl cutting machines the Vinyl Cutter USCutter MH should by no means be considered a “lower grade” choice. 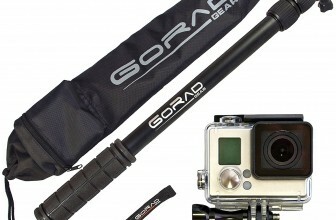 It is however, more simply put, an excellent “beginner’s device” for those looking to get the most for their money. And with happy hobbyists and business owners alike reporting consistent and practical use over 7 years or more with issues this makes sense for our top pick as the best vinyl cutting machine for the money. For those that regularly make larger signs and decals you are given the ability to save unruly costs and fees associated with making even the ‘simplest’ of projects such as lettering by having this cutting machine now to do it yourself – as many times as you’d like – using various unique designs. Few customers have expressed frustration with the fact that even as a 34″ cutter that this machine is not able to cut 34″ wide lettering or designs. While this is true, it comparably maxes out typically around 31″ wide each, and although this is something that is illustrated through the product description is a good example of why necessary research should be conducted before investing your money into the best vinyl cutting machine for you. Some may experience difficult with the “plotting software” included with this device. However, it does include a free year of the SmartCutPro software or the Rhino 3D as mentioned above. There also many options online for various other (free) plotting software for various user levels and experience. For most people a one-year trial is a more than enough time to determine whether it’s the right cutting software for you and your device. In comparison to other vinyl cutting machines this one stands apart because it is more “open source”, does not restrict you to one software as highlighted above, and is much more flexibility with the file types, designs, and in consideration of the many major (free) online marketplaces for downloading designs this remains a viable investment for the money paid. 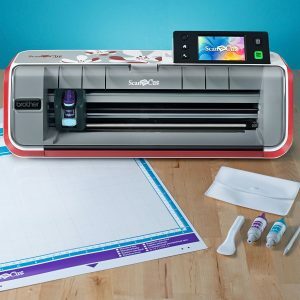 If you’re looking for a vinyl cutting machine on a budget then the Silhouette Cameo vinyl cutting machine is a great kit to consider, includes a user-friendly, simple, and practical software to help you get started, and includes practically everything you’ll need to start cutting out projects right out-of-the-box. For those tired of die cutting machines this is definitely a step up in experience, compatibility, and quality. 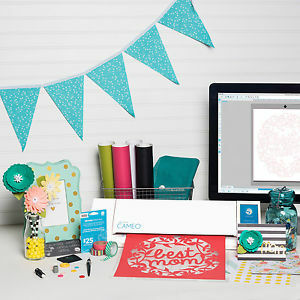 It’s also great for making shirts, cards, mugs, and other personalized designs, logos, cutouts, and decals. If you’re an arts and crafts enthusiast and find yourself working a lot with stickers, vinyl paper, or contact paper this is great to make silk screens for t-shirts and other apparel. It does everything that it’s designed to do, and making mats out of easy to find and affordable sheets is a great added benefit. 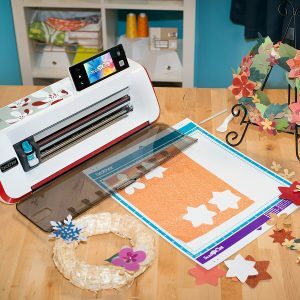 This vinyl cutting machine comes with a helpful, friendly and fun Silhouette Studio App, and is hailed by customers as easy to use for making both new designs or bringing ones to life from your own sketches. For those that are just getting started with vinyl cutting or looking for a simple to use device this is great as it relies directly on its capabilities and commands from your PC. It also doesn’t require cartridges which makes it a big money saver as well. Many craft hobbyists and professionals have used Silhouette (Silhouette America) products before or return to use vinyl cutting machines like this one as it works the same as most other vinyl cutting machine but for a fraction of the price. An added luxury like the included touch-screen is a great way for customers to maximize their experience, and get similar quality as competing, hundreds if not thousands of dollar more machines on the market. There are also lots of free design files available through this company that are “free with purchase”, so customers can not only take advantage of this but also the free $25 credit to purchase other designs and digital files from the online Silhouette store. 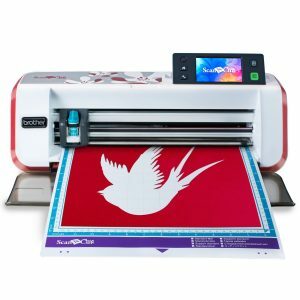 Overall, if you’re looking for the best vinyl cutting machine on a budget then the Silhouette Cameo is perfect for both saving money and designing fun, creative, and original 3D invitations, cards, t-shirt stencils, and more. Some customers have reported back frustrations and difficulty measuring and cutting papers or materials properly in depth with the included blade. Even calibrations can be difficult, and users may feel as though they’re experiencing “malfunctions” but may just need to familiarize themselves a bit more with how circuit vinyl cutting machines work, read carefully through the manual and directions – more than once if necessary – and search the internet for various helpful and how-to videos for using a vinyl cutting machine. Customer service experiences and honoring the warranty has been reported as consistent with this cutting machine, and although some feel as though they shouldn’t be responsible for the costs of shipping-returns, it’s important to keep in mind that many vinyl cutting machines on today’s market will not even provide a comparable warranty as the Cameo. Worse, others may even charge you for the cost of replacing parts. As a new, or experienced customer just keep in mind that while not every vinyl cutting machine software is made for the same level of experience, the one included is considerably a beginner’s software and most of those with basic knowledge and experience using layer software do well using this product. There are also of course plenty of other free design software’s available that are likely to be compatible with this vinyl cutting machine, so by no means should this be a deal breaker for anyone serious about getting the best vinyl cutting machine on a budget. If you want to maximize your experience and overall ability to be successful using your vinyl cutting machine (as briefly outlined above) it’s worth taking the time to invest time – if you are a beginner – researching, studying, and watching videos on places like YouTube or other vinyl cutting machine enthusiast websites and forums. Getting the blade depth right with some vinyl cutting machines, using the write paper materials, programming the designs, downloading the software, and even using the software will make much more sense if you go this route. Before deciding on which vinyl cutting machine you’re most likely to buy, try to go above and beyond to carefully read through not only the warranty, but also customer service, and any feedback of reputation located throughout the internet. While of course using discretion, you might be surprised to find out how much feedback is openly posted online directly related to manufacturers of vinyl cutting machines honoring their warranties, their reputations, and other models. It’s helpful to see the type of background the company you are buying from has, and it’s more than likely that through exploring their other previous, or current vinyl cutting machines that you’ll get a better idea as to what types of hobbyists and professionals they’re designed in mind with, and who benefited from them the most. Maximizing Your Search: Are these the right Vinyl Cutting Machines for Me? If you’re in the market for finding the best vinyl cutting machine for either your hobby or professional needs there are several great products, with positive customer reviews and designed for various experience levels outlined here. So, if you’re on a budget, and unsure of what the best product is for you, keep in mind the types of vinyl cutting machines with a solid reputation for producing these machines, ones that offer complimentary (easy to use software), a solid manufacturer’s warranty and of course quality customer service. Don’t ever be afraid to call a company in advance of buying their product just to “test the waters out” and see what kind of people and company you’re dealing with. Silhouette America has a very consistent and well-known reputation for producing reliable, easy to use, and long-lasting vinyl cutting machines that are ready to use out of the box. The Silhouette Cameo (and the newest Cameo 3) are great examples of this. Brother has also been making circuit vinyl cutting machines for quite some time, so going with a company that has the experience, reputation, and expertise with designing the type of vinyl cutting machine you’re looking for is the best direction to go as a customer. 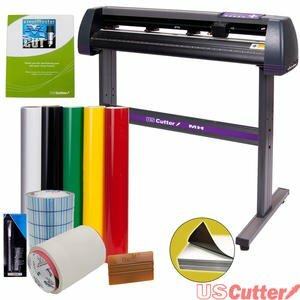 If you own your own business or have the frequent need to produce larger decals than the Vinyl Cutter USCutter 34” is a great way to go and sure to meet all your needs, while still remaining the best vinyl cutting machine in comparison to the competition. Overall we’re confident that as you’ll find with each of these vinyl cutting machines we have not sacrificed quality for the price, and that you’ve come to the right place for maximizing quality with cost, no matter what your budget may be.